Blog What Is A Dental Assistant? PEOPLE ARE COMMONLY CONFUSED about what the exact role of a dental assistant is. What does an assistant take care of vs. a dental hygienist, for example? We want to set the record straight! To be honest, we couldn’t get much done without them! In Tennessee dental assistants have to have education. Dental assistants have to be a Registered Dental Assistant (RDA). In order to be an RDA you have to be accepted into a program for dental assisting. Most of these programs require pre-requisite courses and then being accepted into a year long program. Chattanooga State has a program here in Chattanooga to help train dental assistants. There are several others in town from for profit schools. These programs are easier to get into, but they are much more expensive. A dental assistant must maintain their license. This requires having 15 hours of continuing education each year plus maintaining CPR training. Dental assistants, assist the dentist in every thing they do. Dental hygienist are the professionals that clean your teeth. 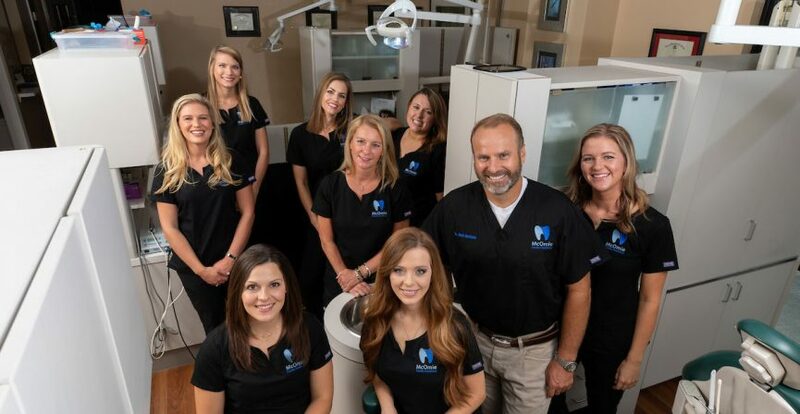 Here at McOmie Family Dentistry in Chattanooga all of our employees are trained and either hold a dental hygiene degree or they hold a dental assisting degree. I mean everybody even the front desk are cross trained dental assistants. Our front desk employees are all registered dental assistants. We do this so we can cross train front desk and chair side assistants to handle each others jobs. This allows us to be more efficient. When you call our office you are talking to a trained and educated dental assistant. This allows you to ask dental questions and they can be answered by a professional. These are the dental equivalent of nurses. Imagine if you could call your physician and the person that answered the phone wasn’t just a scheduler but an actual nurse. This is the level of customer service we offer at McOmie Family Dentistry. Dental assistants at our office have to have a great knowledge. They need this because we do many many procedures. We cover implants, dental implant crowns, root canals, extractions, cosmetic fillings, dental veneers, gingvectomy, metal free crowns, dental bridges, dental bonding, and the list goes on and on. The assistants have to know how to do each and every procedure. They also have to have the knowledge to answer patient questions. Dental assistants make X-rays. At McOmie Family Dentistry this means using the computer to take a digitalX-ray. Dental assistants use our digital scanner. We use our scanner all day long dental assistants can make the pre-scan for permanent restorations. This is a real skill and it takes time to develop these skills. Our assistants are masters at scanning. Traditional impressions are still used from time to time and they do this as well. Pouring stone models out of these impressions is also a task of the dental assistant. I think you get the picture the role of a dental assistant at our office is diverse and full of tasks. We love our assistants here at McOmie Family Dentistry we would be lost without them.